The Royce Code Review - It Is 100% Scam Software! 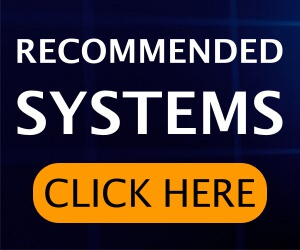 The Royce Code Software is the latest entrant in series of ongoing scam Binary Options Auto Software Industry.You’d say how can we quickly jump to this conclusion? We know that its too early to pronounce the verdict given the website itself has been floated on the 2nd of December only. But, we have solid evidence to support our conjecture. Read the complete Royce Code review and see for yourself how The Royce Code is here to fleece your money. The age old formula of making you feel special works here too. 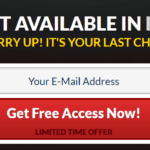 You are told that that only a select few have been chosen for this exclusive software. Only for the next 7 days, just 15 beta-testers would be given a chance to be a part of this, they say. Richard Royce, the Founder and CEO of the Royce Wealth Group is first shown alighting a Mayback. An outside glimpse of his luxurious house is also visible. This show of wealth is the bare minimum prerequisites and a regular feature of these advertorials. Richard states that his company manages $2 billion worth of assets for himself and his clients. That is an astounding count and really eye-popping! The USP of The Royce code is that it is the world’s first automated and insured profit code. A guaranteed insurance of profits is a new and innovative strategy to lure traders. Roping in a well-known and reliable third party insurance company is highlighted as a guarantee of never making any losses. This is understated with a disclaimer that at the moment only profits for the last 24 hours are insured. Richard asserts that all the profits made by the traders can be fully withdrawn and the proceeds be transferred to your bank accounts. All this would take a worst case time of 24 hours. There are wealthy investors involved in the trade who demand surity against losses. Since you are going to be getting the same access as them, you are also insured! Now let us move to show what facts and figures does Richard claim in the video. A minimum of $2000 can be made with your trading account. Auto-pilot mode for hassle-free and minimal effort trading has become another “should be there”. Richard gushes that this “club” is exclusive for rich clients only. This is the first time when the minimum deposit of $25,000 has been relaxed. But, ever since their “innovations team” has been secretly working on a brand new project for the last 18 months, this has become a reality. He claims his team of developers went over all the trades that their systems have ever made and “encoded everything into a single algorithm”. So much for the algorithm details. We are not hearing anything new with their algorithm that is. Scores of other auto trading software claim the same. Why it is all Fake? 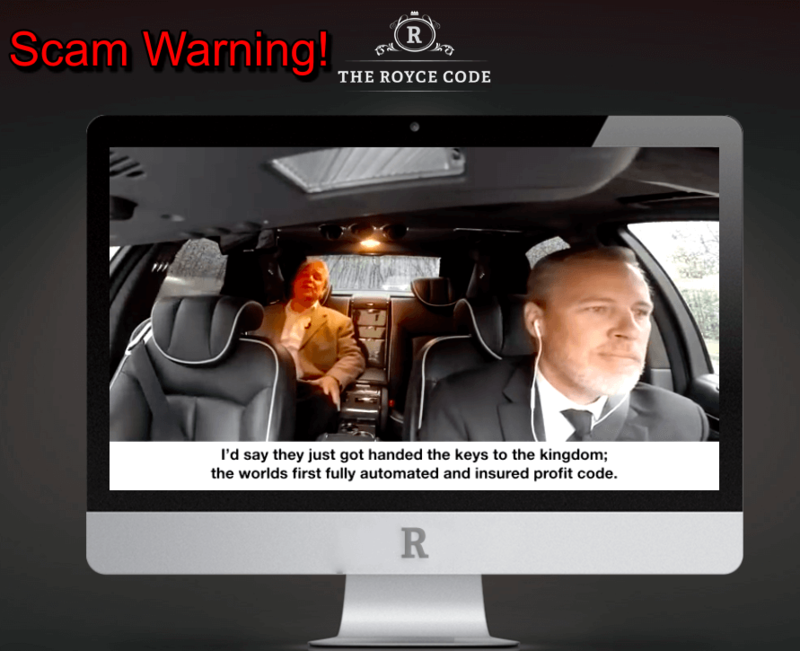 We have researched the Royce Code software offering in detail and concluded that it is a SCAM software. The wealthy Richard that you see in the video is no Richard Royce. Rather, he is an actor who goes with the name Kevin S. Martin. He has appeared in many videos and has a website of his own. You can visit the website and see the real face of the Mayback-owner, manager of billions of dollars and the uber-rich Mr. Royce. This is the link to his website. Just immediately we are shown inflated bank account statements and exaggerated or hyped up claims about how one can easily become a millionaire. There is are many ways to become a millionaire but investing in fake signal generating and auto trading bot software is just not one of them. Now, let us expose the fake testimonials too. Do you recall Mr. Watson from the Obcasio scam? If not then let us tell you that they have hired professional actors to give fake reviews for this software. There is not an inch of truth in the crap that they utter. After all an actor just reads through his scripts and enacts whats asked of him. Suddenly the hirer of beta-tester and the the rich guy Michael has turned a beta-tester himself! What a pity. Similarly, another paid actor rents his voice as Steven whom Richard calls on mobile. Richard introduces himself and asks Steven of his views and feedback on the software which he has just started using ” just 3 hours back this morning “. In these 3 hours, he reports to have made $1500. You are told that in the least likelihood of a broker reporting bankruptcy, you are insured of atleast $5 million. This is the height of telling lies. For one, you are never gonna make such huge profits and Two, why would any insurance company insure you when you are part of such a volatile and risky trade! The insurance companies strictly stay away from such businesses. At the end of the day, the companies are also doing businesses. Without your actually depositing insurance premiums how can you get insured. Leave premiums- without you actually first approaching an insurer and actually buying a policy, its sheer stupidity to give importance to this malicious claim. In between all this a nasty popup keeps on coming. It says once you register you’ll be eligible for a spot bonus of $10,000. All lies and nothing else. 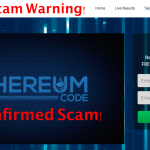 Verdict – The Royce Code Is 100% Scam! Avoid It! 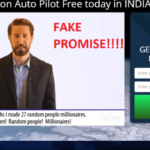 Best Binary Options Auto Trader From Past 3 Months! We strictly advice you not to register for this APP at all. I think our review is enough for you to decide and convince you that this is all a hideous ploy. A big piece of BS and nothing more. 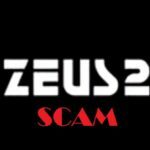 Such Websites and Scam APPs come and go within a matter of a few days or weeks, not before tricking innocent people of their hard earned moneys. Such experience can scar people’s lives permanently. With these words we wrap up our The Royce Code review and hope we have equipped you enough to steer clear of such misadventures and SCAMS. Frequently we are approached by people who fell prey to these online predators. We do not want you to be one of them ever! So, keep faith in your own abilities and do not fall for the Royce Code scam . Never let your greed for money get the better of your thinking power. It may numb you with the mere dream of becoming rich, but make it a habit to pinch yourself to get grounded again!